Step into the shoes of an airline flight booking agency and see if you can efficiently fill up the seats on your airplane without bumping anyone off due to it being overbooked. Players will use patterns on passengers cards and rotate them into the best position to use space wisely and to gain the most points. Overbooked is a challenging and engaging game where 1-4 players almost play against themselves to fill up their seats the best they can. If you can gain the most points you'll win but there are some fun challenges along the way. Learn more about Overbooked below and be sure to let us know what you think of this game. Grab your quality built and entertaining copy of Overbooked today. Review Completed (2017-10-17) No one likes to be bumped off of a flight because it's overbooked. Well, now you have the job to properly fill and place passengers on your flight without making any passengers mad due to it being overbooked. This fun and cleverly themed board game plays heavily off of the same concept as Tetris or other shape constrained games. You'll need to fit passengers on your board based on how they are arranged on their card by finding the best empty spot (rotating is allowed). Different amounts of points are awarded based on how you place passengers and points are taken away if you need to bump anyone off the flight. We had a great time playing this game and liked how the majority of the game was based on your personal flight card. There is some interaction with other players when selecting which passenger card to choose and we liked the addition of the voucher cubes which adds a fun little twist/advantage. Players are trying to gain the most points but they are their own worst opponent. 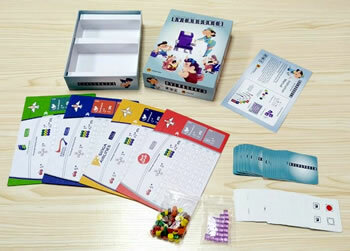 There is little down time and waiting since players move their passengers into position while the game continues. We also liked the fact that you can play solo (solitaire style) or up to four players. There are even three different versions or styles you can play by yourself. Overbooked isn't a cheaply made game and comes with quality made components. The rule book is clear and explains the game well (although more pictures never hurts). The only complaint we had was the complexity of scoring. While this plays into the strategy of the game, it also added a little confusion when trying to figure out who won. Once you understand how to score, you can use this to your advantage but we struggled to understand (one point for every passenger placed in addition to special combinations and patterns mixed with the score board that we don't know the use for). Perhaps more clarification on scoring is needed (unless it's just us). This was a fun game that we all enjoyed playing and it utilizes some fun game mechanics. It would be interesting to see how you could interrupt your opponents' flights and have a more destructive roll for other players in the game, but as is it's simple, strategic and fun to play. The player with the most stars at the end of the game wins. 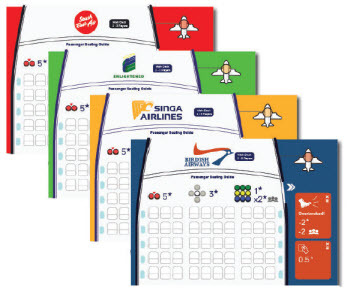 You'll get 72 passenger cards, 24 voucher cubes, 150 passenger discs, a scoreboard, 4 player boards and the official Overbooked game rules and instructions. Please keep in mind that the official Overbooked board game rules and instructions could be different depending on the game version you have. The rules below are some of the exact directions on how to play Overbooked. Share with us your comments, funny stories, tips, advice, strategies, creative ways to play, questions about how to play, problems with the rules or anything you want about Overbooked. All submissions will be reviewed within 24 hours. Click here to add your Overbooked comments.